Monster Miata custom LS K subframe. Designed and built in house. Extremely rigid semi monocoque frame. Getting acquainted with San Diego's finest. Got off with a warning. Some bling on a 331. Cortney modeling our most recent build. New 419 hp 347 in a 1999. Came out really nice. Tire scorcher. Sir Jackie"The Flying Scot" Stewart Cruising the pits at Indy. What a great career. Three F1 championships. " What a great day for motorcar racing" in his Scottish accent. Parnelli is a fun lovin guy unless he is trying to pass you on the last lap! 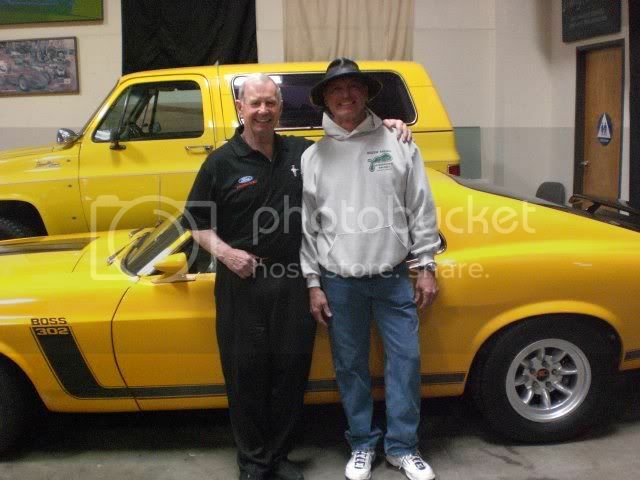 Had a nice time talking to Phil Hill at the Monterey historics back in 1998. The first American to win a F1 world championship. His favorite race car- GT40. Cool! You will be missed . USGP 2001. Our dinner guest was Emmo! The guy is cool! Talked everything from fast boats, watches, planes, Chicks, Penske, Chapman, FIA ...... Would love to spend more time hearing his stories. He act's like a regular guy. Very polite and humble. Sharp contrast to the open wheel racers of present. Bob Bondurant states his approval after Flogging Toolboys Monster around Willow Springs for a couple of sessions.. A rev limiter would be a good thing to have with Bob doing the driving. Yikes!. I learned more about high speed driving from Bob in that one day than all others combined. Another great teacher is Danny McKeever. His school " Fast Lane" at Willow Springs covers everything to do with going fast. Danny has been Long Beach Grand Prix Celebrity Challenge teacher since the beginning. Some of his students include Cameron Diaz, William Shatner, Vince Neil, Jesse James to name a few. Check it out on my links page.